Charles Dickens at 200 to the left, Drawings from the Louvre to the right. Last Sunday afternoon TD and I made a trip to The Morgan Library and Museum, a wonderful place to visit here in New York City, at Madison Avenue and 36th Street. Beginning in 1890, financier Pierpont Morgan (1837-1913) began assembling a collection of illuminated, historical, and literary manuscripts, early printed books, and old master paintings and prints. 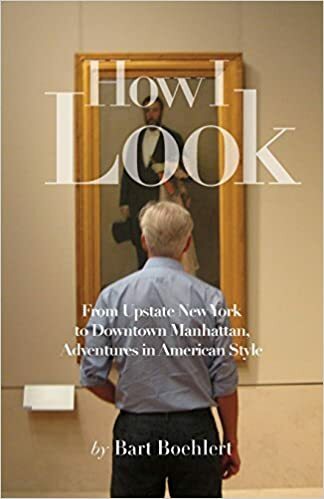 Like Henry Clay Frick who was collecting artwork uptown on Fifth Avenue for the Frick Collection, Pierpont Morgan was a voracious collector who bought at an astonishing rate. Mr. Morgan's library was built adjacent to his residence between 1902-1916 by the renowned architectural firm McKim, Meade and White. After Pierpont Morgan died, his son J.P. Morgan Jr. transformed the library into a public institution that visitors could enjoy. I had in mind specifically enjoying the current exhibition that is up on Charles Dickens. 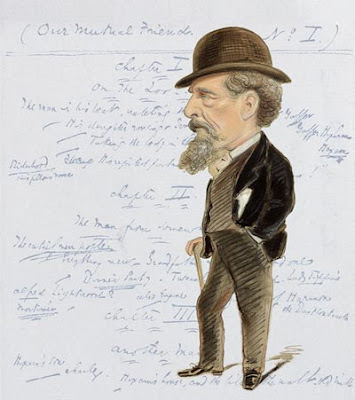 Dickens was born in 1812 so this exhibition of handwritten manuscripts and penned letters and portraits celebrates the writer's 200th birthday. We passed under this metal grille ceiling into the show. The accompanying text reported that Dickens wrote with a goose quill pen from 9am to 2pm each day, cranking out six to twelve pages a day. At shows like this I always enjoy learning about the writer and looking at the clothes. 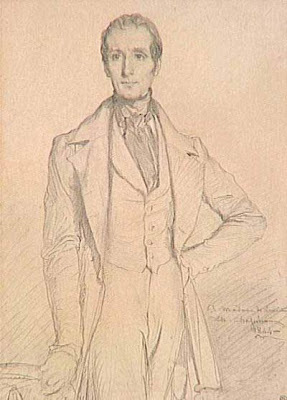 This is a caricature of Dickens by Alfred Bryan; I like the black jacket with grey vest and grey pants. 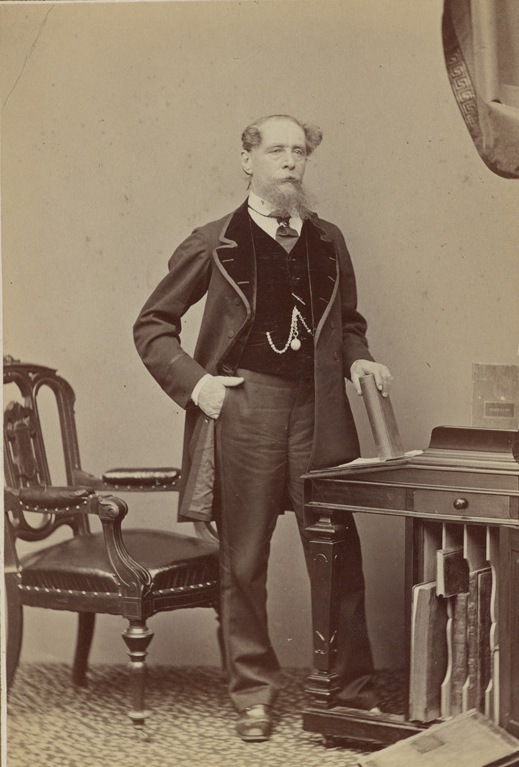 This photograph portrait of Dickens was taken by Jeremiah Gurney in New York City in 1867. The text said that the sitting took so long that Dickens never again submitted for a portrait, and that this is the last photograph of him. I admired the velvet vest and the velvet lapels on the coat, plus that leather and wood chair. I would love to find a chair like that. Then we crossed over into the exhibition of drawings from the Louvre between 1789 - 1848. 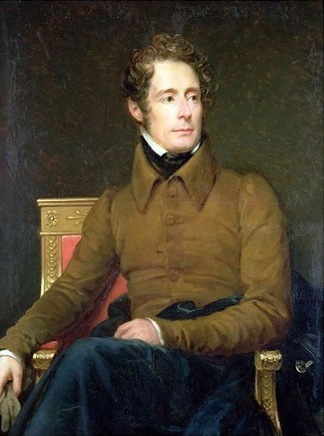 This is an 1844 portrait of poet and politician Alphonse de Lamartine by Theodore-Chasseriau. The long, lean, vertical lines are flattering. Whilst poking around the internet, I found another portrait of de Lamartine, this one from 1844 by Francois Gerard. Elegant guy. This is a double self portrait. What is that you ask? 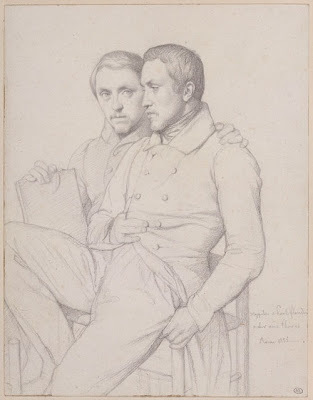 These brothers, Hippolyte and Paul Flandrin, were both artists so Hippolyte drew his own self portrait and Paul drew his, get it? Their clothes look graceful and fluid. No picture-taking allowed, but you should definitely see it for yourself – a couple of extraordinary New York City rooms. By then we were hungry so we sat down for a hamburger and a beer in the cafe in the glass and steel atrium which is part of the library's 2006 renovation and expansion designed by Pritzker Prize-winning architect Renzo Piano. It was a very civilized Sunday afternoon.